Buenos Aires is a city that merits at least five days in your trip planning. Top sights you don’t want to miss are Calle Florida, La Boca, San Telmo, the Recoleta Cemetery and the Obelisk. There are many kind of city tours available. One may choose to go solo and take a walking tour of your favorite Buenos Aires neighborhood downloaded directly to your iPod or MP3 player. These walking tours are cinematic! If you’re not into following the crowd, these tours are for you. Click here for more information on how to download a tour today. Or, if you prefer a tour for just your group with your own vehicle, one can cover the top sights in a 4-hour tour with an English speaking guide. We highly recommend this option for those who want to cover the city in one fell swoop. Make a reservation! If your on a budget, take a group walking tour and discover the history of Buenos Aires’ Plaza de Mayo and Casa Rosada. Email us at reservations@argentinastravel.com to reserve your city tour today. Bring your camera to photograph the brightly-painted, wooden houses lining the streets near the river on the Calle Museo Caminito (the museum walking street) in one of Buenos Aires’ most unique neighborhoods. During the day, this area converts into an open-air art museum, with artists selling reasonably priced, high quality art. 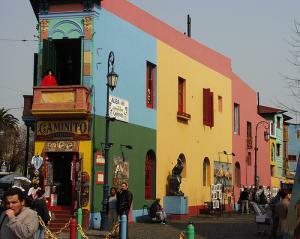 La Boca is home to art galleries, a few museums (the Fundación Proa and the Museo de Bellas Artes de la Boca de Artistas Argentinos are two), shops and restaurants. Perhaps Boca’s most unique attraction is the Estadio Boca Juniors, or the stadium of the Boca Juniors soccer team, where Diego Maradonna first made his mark on the international soccer scene. Get there: Avenida Pedro de Mendoza and Del Valle Iberlucea streets. Tip: For security reasons, avoid La Boca at night, and do not stray from the tourist areas. Florida Street is a pedestrian street located in the center of the downtown on a 12-block stretch between the Plaza San Martín and Plaza de Mayo and is a shoppers delight! The street is lined with shops, restaurants, cafes, street artists and large department stores. On the end of the Florida near Avenida Cordoba is the Galerías Pacifico, one of Argentina’s most beautiful shopping centers; it houses a gorgeous fresco on the ceiling at its center. The Recoleta Cemetery is the crown jewel of Buenos Aires’ tourist industry. Elaborate crypts, many of which are works of art, line a maze of gravel mini-streets that house the final resting places of Argentina’s elite, including former presidents, sports figures, leaders of society and most famously, Evita Peron. If you visit on a weekend, check out the artisan fair right outside the cemetery to shop for souvenirs of clothing, art and jewelry, and the ubiquitous mate cups, leather goods and gaucho materials Argentina is famous for. Get there: Junin and Guido streets/Free admission /7am – 6pm year round. Tip: Call ahead at 54-11-4804-7040 to arrange a guided tour in English or email Argentinatg@gmail.com to book your tour. If you have an adventurous spirit, are in decent shape, and have limited time, visit multiple neighborhoods with a local guide by taking a city bike tour. Up to three-hour tours are given every day in English and on weekends in different parts of town. 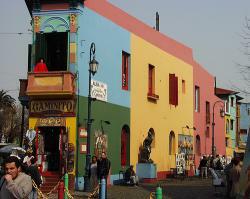 Tours start at $15 dollars, and depart from and arrive at Pasaje Guiffra 308 in San Telmo. Visit www.labicicletanaranja.com.ar for more details. Located in the center of Buenos Aires’ theater district on a boulevard separating Latin America’s widest street (the 9 de julio), this 220 foot monument is one of Argentina’s most popular sights. Inaugurated in 1936 to commemorate the 400th anniversary of the founding of Buenos Aires, it is where Argentina’s flag was first raised. Today, porteños use the obelisk as a rallying point, and hold concerts and protests here. Get there: Avenida 9 de julio and Corrientes streets. Tip: From the obelisk, it is just a three-block walk to visit the Teatro Colón, one of the world’s most prestigious opera houses. Although closed for renovation through 2010, the outside of the theater is an architect’s dream. The address is Toscanini 1180. An enclosed rose garden (the “Rosedal”) with a lake, surrounded by a paved, mile-long running/walking track is the epicenter of Palermo’s February 3rd Park system. Porteño families flock to these “lungs of Palermo” on weekends to rent bikes, paddle boats, rollerblade, pedal-push carts, feed the ducks, visit museums, or just to stroll and picnic. During warm weather months, the city rents balls for pick-up soccer and basketball games, and sets up a small toddler play area along Sarmiento street. Tip: During the warmer months (November – September) the city sponsors a free open-air concert series at the Rose Garden on Sundays at 4pm. 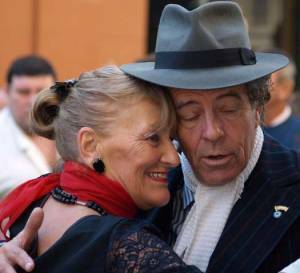 Head to San Telmo on Sunday morning to experience the Feria de San Pedro Telmo (the San Pedro Telmo fair) that takes place at one of Buenos Aires’ oldest squares. Each Sunday, hundreds of merchants set up shop to sell their wares, new and old, perfect for gifts or that special antique at a fair price. Afterwards, head to one of the neighborhoods’ many quaint restaurants for a late Sunday lunch. Get there: Carlos Calvo and Defensa Streets, San Telmo. Sundays, 10am – 5pm. Tip: Leave your passport and valuables at home and watch your wallet, as pickpockets unfortunately like to “shop” at the Plaza Dorrego as well! This plaza is the center of Belgrano’s main tourist attractions, also home to an artisan fair on weekends. Two museums (the Museo de Arte Español Enrique Larreta and the Museo Sarmiento) and a beautiful church (the Parroquia de Nuestro Señora de la Inmaculada Concepción) are located on three sides of it. From the plaza, walk the streets towards Libertador avenue and the Palermo neighborhood to view the French style boulevards, beautiful mansions, high rise housing and expensive shops that line the cobblestone streets of this historic part of town. The “wooden port” is Buenos Aires’ oldest neighborhood, where the shipping industry was based until the creation of Puerto Nuevo, or the “new port.” Recently renovated, the area is now home to a well-lit and popular river walk, lined with chic restaurants, bars and an imposing view of the port’s majestic bridges, historic battleships and emerging skyline. It is an excellent choice for a dinner with a water view, and a scenic post-dinner evening stroll. Get there: Avenida Alicia M. de Justo. This page rendered in 0.17 seconds.